Magna/Cure® Direct Emulsion are photopolymer/ diazo based, dual cure photostencil systems which provide remarkable image quality and exceptionally durable stencils. Premium emulsions for use with UV, plastisol, water-based and solvent-based inks. UDC-2 provides the perfect combination of price and perfomance. With superrior exposure speed, latitude and moderate water resistance, UDC-2 is the ideal selection for printers in nearly every category. Universal emulsion offering excellent resistance in any imaging application. 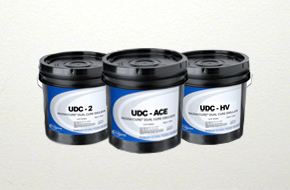 UDC-ACE was designed to work as traditional or automatic coating emulsion. This new high viscosity emulsion allows for easy coating on low or high mes counts while offering the resistance and durability of a dual cure emulsion. UDC-HV is the ultimate emulsion when it comes to quality and value.